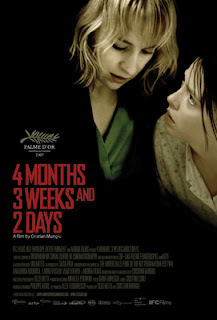 Cristian Mungiu's Palme D'Or winning 4 Months, 3 Weeks, and 2 Days is a film that I had to let sink in a while before I sat down to write a review. It is a film the demands to be reflected upon and mulled over, because it is a film with so much to offer. There was a moment in the film when I realized I was watching something truly extraordinary. Nearly an hour into the film, Otilia (Anamaria Marinca), a college student who is helping her roommate attain an illegal, back-alley abortion in Communist controlled Romania, goes to visit her boyfriend's family for the first time. It is a dinner scene that lasts for nearly eight minutes done in a single take with no cuts, that serves no real purpose in terms of plot, but means everything in terms of character. Otilia, who has just done the unthinkable to ensure her friend gets the abortion she so desperately wants, sits in the middle of the shot, and while the conversation around her consists mainly of mundane bourgeois chatter, her facial expressions and her demeanor over the course of those eight minutes tell a story unto themselves. Such is the beauty and power of Marinca's incredible performance as a woman whose devotion to her friend takes her to great lengths in a society oppressed by a totalitarian regime, where the government dictates a person's livelihood and suppresses personal freedoms, making abortions illegal and therefore much more dangerous to perform. A brilliant example of the New Romanian Cinema, 4 Months, 3 Weeks, and 2 Days, like Cristi Puiu's 2006 The Death of Mr. Lazarescu, uses long takes, few edits, and a lack of musical score to create a raw, earthy realism. It moves slowly and takes its time, but it's a gripping work, drawing the audience in and refusing to let it go. It's a sometimes agonizing build-up to the inevitable abortion, but that's not really the focus here. Many have called 4 Months a pro-life film, but I wouldn't say that. It confronts us with decisions too powerful to be ignored but it never stoops to preach. Instead it takes a neutral stance and lets the audience come away with its own feelings. But contrary to popular belief, this is not really so much a film about abortion as it is about oppression. Under the Communist regime in 1987 Romania, people were forced to make terrible choices out of desperation, and 4 Months, 3 Weeks, and 2 Days examines the profound emotional toll that one such decision makes on two women with nowhere else to turn. Cristian Mungiu has crafted a fiercely engaging work of art, whose brilliance stems not only from its naturalism, but from the extreme effectiveness with which it treats a difficult subject. It refuses to make compromises, and it's a jaw-dropping oversight that the Academy did not see fit to even include this as a finalist for the Best Foreign Language film Oscar. 4 Months, 3 Weeks, and 3 Days is a searing, unforgettable film that is a future classic of the New Romanian Cinema, and the first masterwork of 2008. Opens Friday, 1/25 in New York, and 2/1 in additional cities. "Instead it takes a neutral stance and lets the audience come away with its own feelings. But contrary to popular belief, this is not really so much a film about abortion as it is about oppression." Exactly. It's too bad this thing gets shorthanded as "The Romanian Abortion Film" because it's so much more than that. If nothing else, it's an amazing work of suspense. I never commented on this review before, but wow it is a good one. Makes me want to see it even more.